I’ve just completed my first week as a photo/multimedia intern at washingtonpost.com! As I previously blogged, the .com newsroom is going to take some getting used to because it’s unlike any other I’ve worked in before. But I am definitely getting there and now am a lot more comfortable working with the different programs and processes the way the actual photo editors do. On a somewhat related note, the whole eight-hours-a-day/40-hours-a-week, being-in-the-city-all-summer thing will also take some getting used to. You’d think big cities wouldn’t be an issue. I was born and raised in Houston, Texas, where I spent the first 18 years of my life — but ever since I graduated from high school three years ago, I haven’t been in Houston for more than three weeks at a time. The schoolyear is spent in Columbia, Mo. (population: 100,000ish, which to me is tiny), and the summers were spent in the New Mexico mountains… until now. So for three summers, my office was 137,500 acres of rugged mountains, and in every job I’ve held except one, I was generally in charge of my own schedule and could determine what tasks I needed to accomplish on a day-by-day or week-by-week basis. Now, the real world strikes, and I’m doing my best to keep up. I can’t lie — I’m a little homesick for mountains and trees. Those kinds of surroundings can’t be replaced by tall buildings or even the White House and Capitol Building. But I am learning a lot and slowly-but-surely getting used to working in an office for eight hours a day. And don’t get me wrong: I’m definitely glad I have this internship! I think Jeff and I are going to make strawberry shortcake tonight. 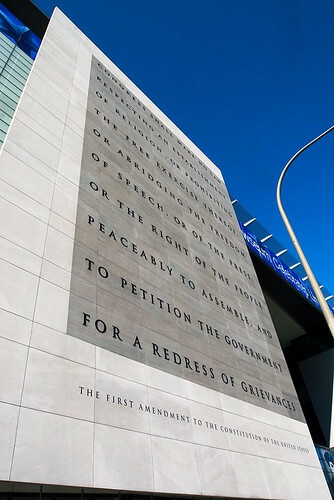 Tomorrow, we’re going to hit up the Newseum. 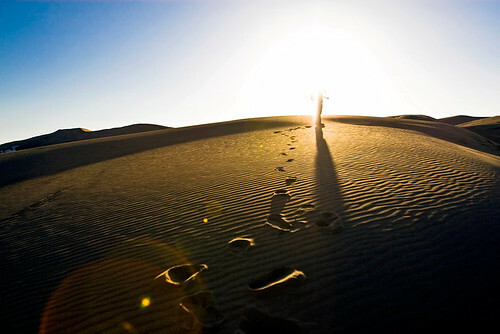 When we return from that, I will certainly be sure to qualify it as a failure or non-failure. Today was my first day as a photo/multimedia intern at washingtonpost.com. After the intern orientation wherein all 20-something interns for WP.com, Express and the Slate Group learned some basic facts about the company, etc., we split up and spent the rest of the day with our departments and supervisors. I have worked in two newsrooms before — at the Maneater student newspaper and at the Missouri statehouse bureau for The Columbia Missourian — but was in for a surprise today when I got to know the WP.com newsroom a little more. For one thing, it’s very quiet, and only about half the chairs in the multimedia and metro sections of the newsroom were occupied. For another, I learned pretty quickly that, as far as photo at the .com goes, they take what’s given to them (by other .com people or the print Post) and work to put it on-line. In the other newsrooms in which I’ve worked, the pace was almost always frenetic and frantic. Reporters and photographers alike were shuffling or rushing in and out: in to produce, submit or edit content and out to get that content. Unless it was a slow news day, the newsrooms were always a little loud and fast-paced. But the WP.com newsroom — again — is quiet. And the photo editors wait to receive requests and content before they process anything. It’s unlike any newsroom I’ve encountered (to be fair, I haven’t encountered that many). The bottom line is, unless I take my own initiative on projects and stories I want to pursue, my responsibilities would consist mostly of working on Faces of the Fallen, putting photo galleries together and fielding photo requests. My plan for the summer? Get as much work and experience in the field as possible, but get some more experience at the desk and in the newsroom, as well. My supervisor Dee seems very open to my both spending time in the newsroom and taking initiative with stories (as long as I don’t tread on the print Post‘s toes), which I definitely appreciate and am excited about. Now I just need to figure out what I want to do! 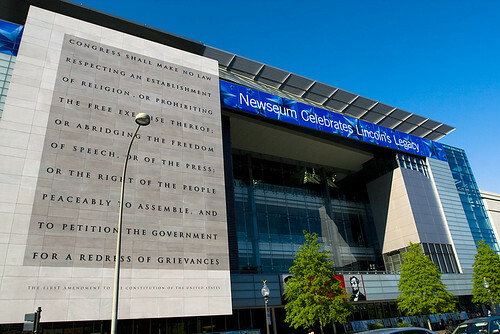 Okay — the Newseum itself is not a failure. The last time I visited the Newseum was in 2001, and that was before it moved and upgraded to its current location on Pennsylvania Avenue. So I can’t really qualify the renowned journalism museum as a failure if I haven’t even visited the new facility (yet). More accurately, the Newseum visitors guide is a failure. The cover looks nice. It’s got D.C. traffic going through on Pennsylvania Avenue. It’s got some nice evening light. Most importantly, it’s got the First Amendment on a slab for everyone to see. Unfortunately, the cover is a gross misrepresentation of how the Newseum actually appears. 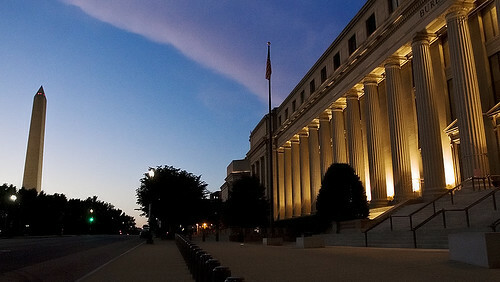 This photo was taken at 16mm (a very wide focal length), from the median of Pennsylvania Avenue, on May 21. There is a streetlight RIGHT IN FRONT OF THE FIRST AMENDMENT. But somehow, the photographer who shot the cover of the Newseum visitors guide didn’t get the streetlight in his photo. Jeff and I discussed the matter when we first saw the visitors guide and noticed the streetlight was missing. We considered that perhaps the cover was an artist’s rendering, not unlike those that architects and designers draw up before a building is constructed. But then we saw the detail in the background of the photo (example: the leafless tree, the appropriate exponential spacing between the time-elapsed cars), which you can view for yourself here. Then we searched the brochure for photo and other credits, which we found on the inside of the back cover. According to those credits, “Newseum exteriors, Annenberg Theater, Pennsylvanue Avenue Entrance, Today’s Front Pages” are by a Sam Kittner. I googled Sam Kittner and found that he is definitely not an architect or illustrator, but rather a photographer who relies heavily on exposure trickery and post-production editing. The cover is definitely a photograph and not an illustration or artist’s rendering. Kittner took the photo before the streetlight was installed. Kittner edited the streetlight out after taking the photo. Option (1) is possible… except also according to the inside of the guide’s back cover, the guide was printed or at least final-edited in March 2009. So unless the city were doing some streetlight renovations before Kittner’s deadline for the March 2009 publication, the only option left is (2). 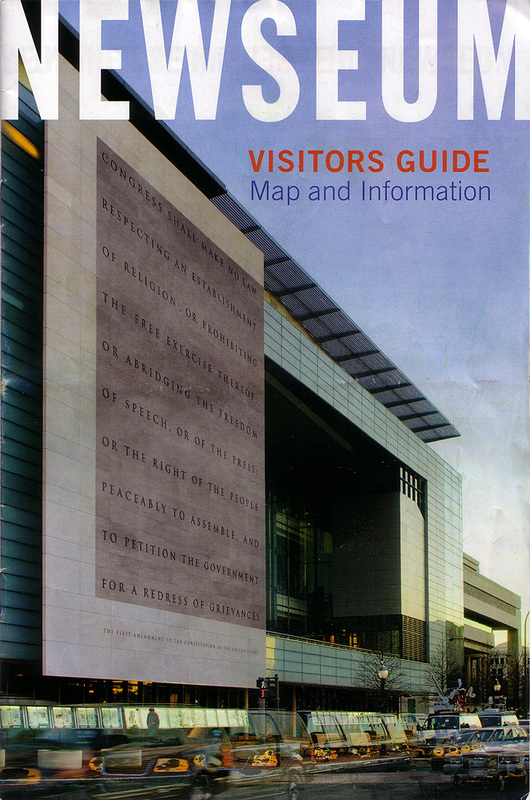 Therefore, I conclude that the front cover of the visitors guide to a first-class journalism museum has been photoshopped to remove a streetlight that in reality stands in front of the First Amendment. If that’s not a glowing demonstration of photo editing ethics on a journalism museum publication, I don’t know what is. Option (1) appears to be the winner here. As Joel has pointed out using the below image, the streetlight was not installed until at least shortly after the Newseum’s new facility was completed. So perhaps Kittner’s photo on the museum’s visitors guide cover was taken before the streetlight was installed. At this point, I’m not going to offer any further speculation on that matter. On a related note, a Twitter debate ensued my blog post, and several other MU journalism students (@mcavanah86, @jmsummers and @pfal) argue that the visitors guide is essentially advertising and that using photoshopped images is permissible for advertising. I don’t disagree with that. But if Kittner’s photo were edited, I don’t think a journalism museum should have used it. Commercial purposes or not, a journalism museum should uphold the principles on which the journalism profession is based — and that includes not using photos with objects edited out of them. Tomorrow at 11 a.m., I begin my photo/multimedia internship at washingtonpost.com. I can’t lie: I am excited, nervous and thrilled as all hell out. At 10 a.m., I’m meeting Kourtney for coffee. Kourtney is also an MU journalism student interning in the Post‘s digital newsroom. We’ve never met, but it is nice knowing there will be another Tiger nearby, and hopefully having coffee and arriving together at the newsroom office will help calm our nerves! Today — Memorial Day — Jeff’s family and I are going to Baltimore to visit the cemetery there and then eat crabs. (One of Jeff’s goals for the summer is to get me to eat soft-shelled crab — I’m squeamish about crustaceans still in their shells!) I’ll have photos and everything up tonight from that, and then get a good night’s sleep and be ready for my first day in the morning. In the meantime, here are some photos from Friday! 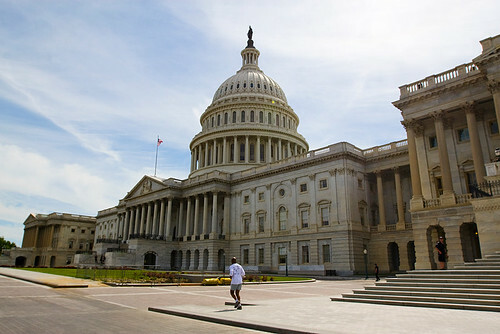 A man jogs in front of the U.S. Capitol Building. As you can read in the post before the previous post, we didn't get to tour the building. 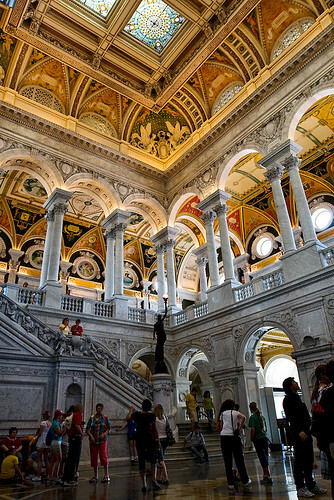 We then went to the Library of Congress, where we also were unable to get a tour and see the rest of the building. 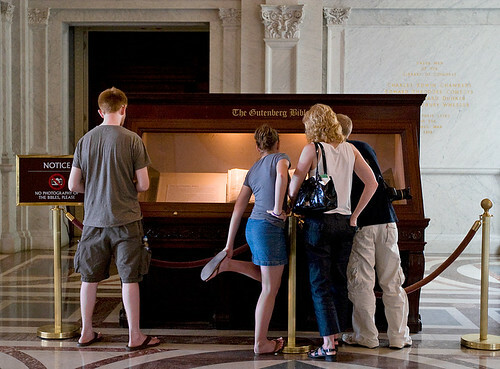 The Library of Congress does not allow photography of the Gutenberg Bible or the Great Bible of Mainz. So, being sly, I took this photo instead. After leaving the Library of Congress and briefly photographing the Supreme Court building, we ate dinner on the Hill and then walked to Nationals Stadium. This is on the way to the stadium. 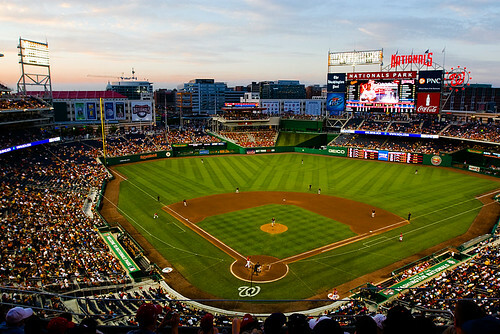 At the Nationals game vs. the Orioles. This is some wonderful evening light over the stadium. As always, you can click HERE to view more photos from Friday and my stay in D.C. thus far. Capitol Building: FAIL. Library of Congress: FAIL. Let me say this not as a photojournalism student or member of the press, but as an American citizen and taxpayer: I am deeply disappointed in the way tours and access are handled at the U.S. Capitol Building and the Library of Congress‘ Jefferson building. You can’t do or see anything in either complex without having to register for a tour. Maybe that’s something to be expected in this day and age, but such restriction was certainly something I didn’t anticipate at all. Some quick backstory: Besides a three-day college-search stint in fall 2005, the last times I’d been in D.C. were summer 2001 (pre-9/11) and spring 2002. The 2001 trip was a two-week blowout wherein my family and I did touristy things for a week in D.C. and then for a week in New York City. The 2002 trip was with my eighth grade class and included the same touristy things I’d done the previous summer. Do I have to take a tour of the historic Capitol to enter the Capitol Visitor Center? No, the Visitor Center is a public access building and you do not need a tour ticket to enter. But when we arrived at the visitors center around 3:30 p.m., a staffer said we could access the actual Capitol Building only if we were on a tour — and the last one for the day was pretty much booked and about to leave. 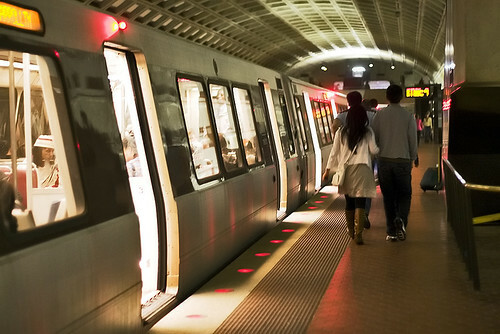 A couple strolls away from a departing train in the Metro Center. When we emerged from the Smithsonian station, the first thing we noticed was how shabby the National Mall looks. I hadn’t been there in seven or eight years, but I certainly didn’t remember the sand/gravel walkways extending as far into the grassy areas as they do now. And where there is grass, it is long and unkempt. Just a tad shabby. We first visited the National Museum of American History, which is undergoing a lengthy renovation (most of the interior work has been completed). 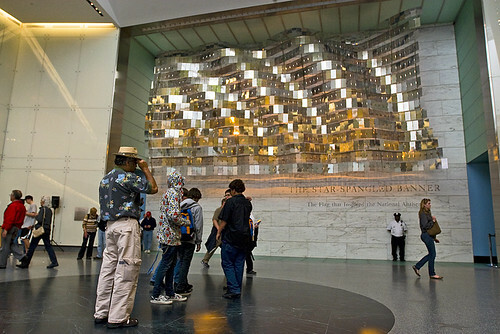 Where the Star-Spangled Banner once hung for visitors to see when they first entered the National Museum of American History, a metallic rendition of that flag is now mounted. On the other side of the wall is the original flag that inspired Francis Scott Key to write what later became the American national anthem. We toured the museum for a while. Besides the renovations and a relatively small photo gallery devoted to Pres. Obama’s inauguration/etc., there didn’t seem to be much new since I’d been to the museum in 2002. So we left and started to head toward the National Gallery of Art‘s Sculpture Garden, but we were sidetracked into the National Museum of Natural History and never made it to the sculpture garden after all. I’d only been to one of museum’s first-floor wings — the one with the dinosaur skeletons, of course — but we definitely explored more. I was impressed by how much there is within the building, which is beautiful in and of itself. I wanted to end the day at a monument or memorial, so when we departed that museum, we headed south. It was only natural to pause by the Washington Monument first. 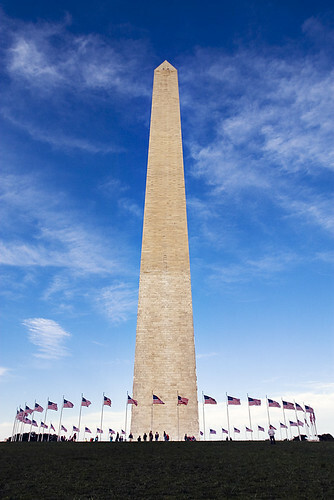 As symmetrical, straight-on a shot of the Washington Monument as I can get without a tripod and about two hours of composing. I'd never visited the monument before, but this is about as close as I intend to get for a while. 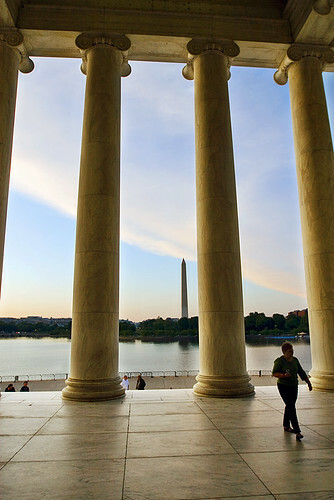 Walking along the Tidal Basin toward the Thomas Jefferson Memorial. …but then I decided I wanted to visit the Maine Avenue Fish Market, after seeing it featured in the journalism movie State of Play. 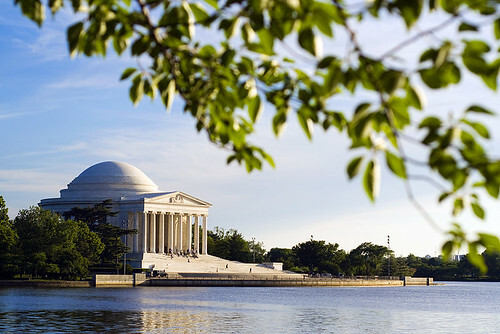 The fish market is, surprisingly, only three or four blocks from the Thomas Jefferson Memorial and the Tidal Basin. 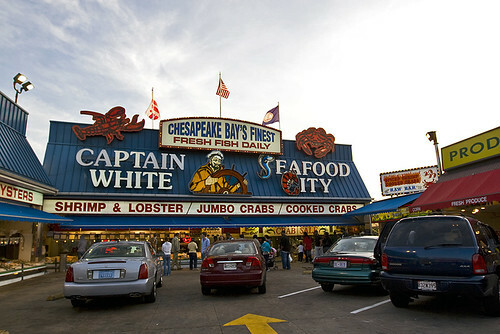 The iconic Captain White's storefront - one of 10 or so such fresh seafood vendors in the market. 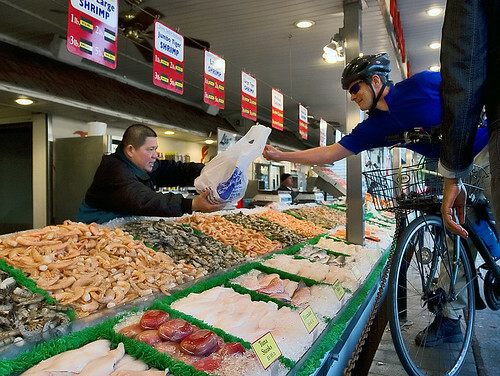 A bicyclist picks up some fresh seafood from the Maine Avenue Fish Market. Jeff and I picked up some (cooked) shrimp and raw oysters, which we took back to the Thomas Jefferson Memorial to eat. But since food and drink are not allowed at the memorial, we first looked around and took photos at the memorial before eating. Walking back out of the Thomas Jefferson Memorial. After Jeff taught me how to eat a raw oyster (something I’d never thought I’d ever do! ), we hurried back to the metro station. It was dark and getting pretty chilly, and our legs hurt. I’m guessing that, with the museums included, we walked 8-10 miles yesterday. On our way back to the metro station. The building to the right is the Bureau of Engraving and Printing. As @robweir pointed out, there are a lot of free things to do in the D.C. area. Everything we did yesterday — except for our ice cream sandwiches, the metro fare and the seafood — was 100 percent free. Which I like. And which I’m sure my wallet appreciates. Today, we took it easy: we saw Angels & Demons and got ice cream from Coldstone. 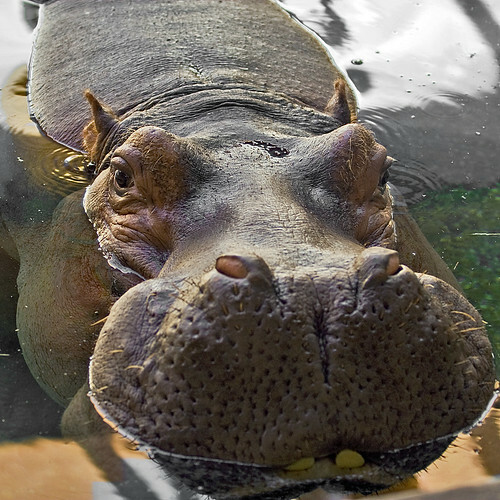 Tomorrow, I think we are going to the National Zoo — where Happy the Hippo is, but not for long! As always, you can view far more D.C. photos HERE. SILVER SPRING, Md. — I’ve been here since Saturday afternoon, but last night was the first time Jeff and I stepped out and took a gander around the area. Downtown Silver Spring is right down the street from Jeff’s house, so naturally that was the first place he took me on a tour. 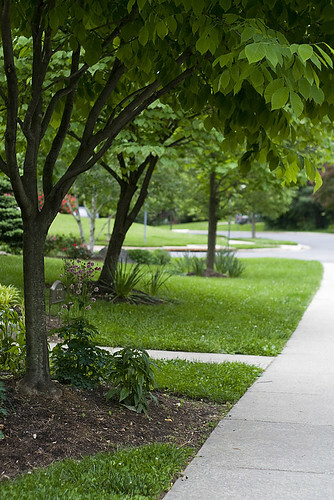 One thing I’ve noticed: Maryland is very, very green. On the way from Jeff's house to downtown Silver Spring, Md. Very little editing was done to this photo - that's how green it is! 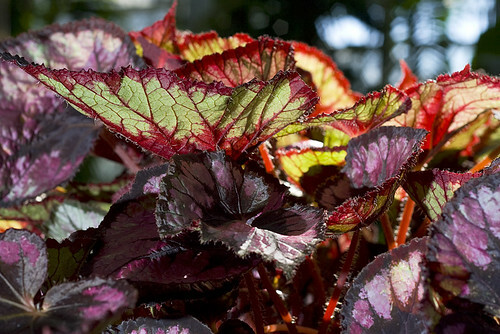 It just screams "verdant"! 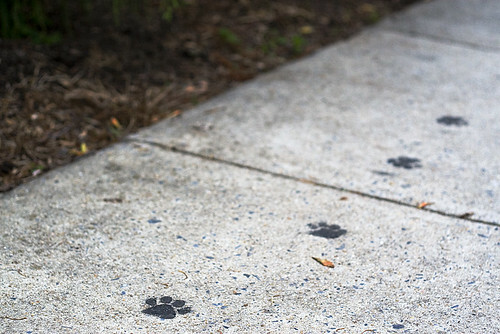 A puppy must have hit up some paint before hitting up the sidewalk in Jeff's neighborhood. Jeff said these weren't here last time he was home (winter break). 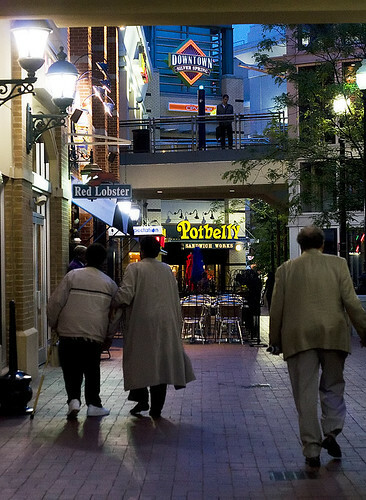 Having lived in a Houston suburb for most of my life, I am always amazed when places like movie theatres, chain restaurants, down-home restaurants, big bookstores and other such amenities are within walking distance of a residential area. My apartment in Columbia, Mo., is about three blocks from downtown — and now Jeff’s house is about five blocks from downtown. 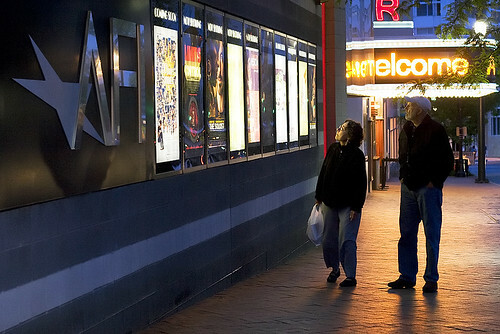 An elderly couple pauses to read the movie posters outside the AFI Silver movie theatre in downtown Silver Spring, Md. 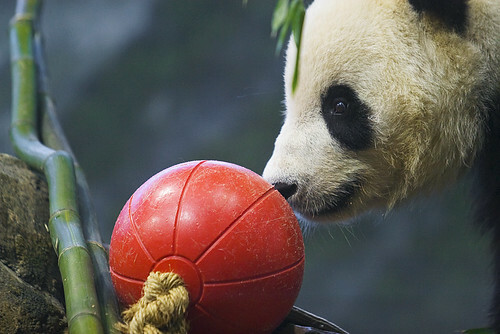 Today, we will probably hit up D.C. itself and some of the museums, etc. I want to get the tourist spirit out of me before I start interning at washingtonpost.com next Tuesday. In the meantime, though, more “90ish days of summer” photos can and will be found HERE. Today, I definitely felt like a member of the Capitol press corps because today was the first time I spent a long period of time in the state House press gallery. 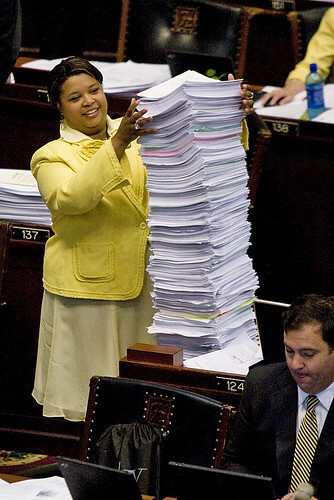 On closing day of the 95th General Assembly's first regular legislative session, Rep. Maria Chappelle-Nadal easily had the tallest stack of paper on her desk. Minority Floor Leader Paul LeVota and Majority Floor Leader Steven Tilley share a fun moment in the rear of the House chamber. 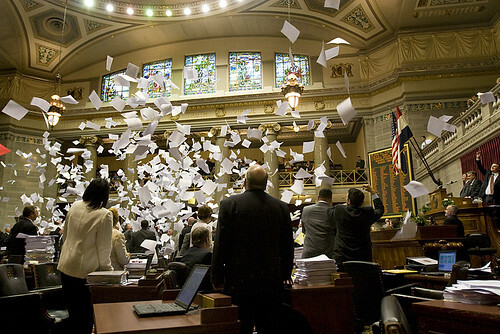 At the close of session, state representatives threw their papers into the air (a tradition). 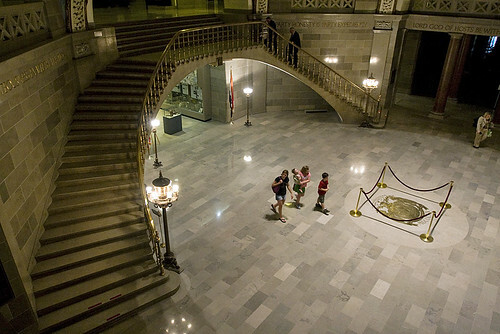 A family walks around the statehouse rotunda after the legislative session adjourned. 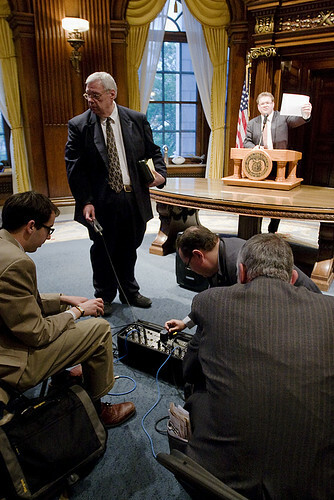 Members of the press set up equipment for Gov. Jay Nixon's press conference. 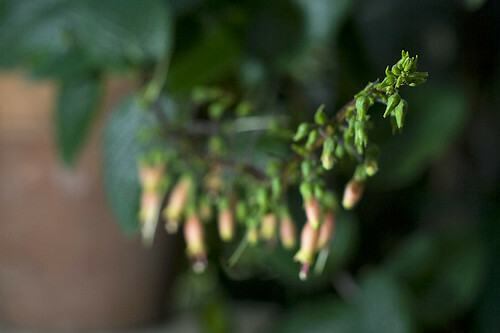 A few more photos can be viewed at my Flickr page. And with that, I close the door on this part of my life. Next semester, I’ll be back a few times, but certainly not on a regular basis or for day-to-day reporting — and anyway, there’s no session in the fall. Tomorrow, I begin a new chapter of my life: I am going to Washington, D.C.! JEFFERSON CITY, Mo. — As I’ve previously noted, today is my last day as a day-to-day (or, two-day-a-week) political reporter for The Columbia Missourian. 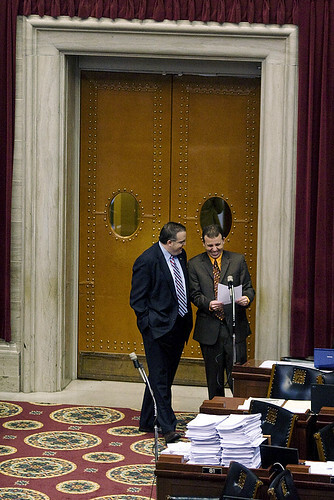 It is also the closing day of Missouri’s 95th General Assembly’s first regular session. Needless to say, this session and reporting on it have been quite a ride. My editor Phill Brooks has been reporting in this statehouse for about four decades, and he’s said several times that he has never seen a legislative session quite like this one. Every statewide elected official is a Democrat, the exception being Republican Lt. Gov. Peter Kinder, and the legislative majority is Republican in both chambers. The session opened with everyone talking about bipartisanship and how that’s what the voters wanted. But promises of working across the aisle seemed to stop there on legislation varying from abortion to AmerenUE to the budget. Reporting on this session has been one of the biggest challenges I’ve ever taken on. As I wrote back in January, I began covering the legislature with only a very basic understanding of the process and the faces who propel the motions. But I flew back two weeks early from Texas to report on the start of the session, and now I am here for the end of it. It’s been a tremendously difficult, exciting, energizing five months, and I’m glad I did it and glad it’s over. I learned this very quickly during a 14-hour House Budget Committee hearing, at the end of which the committee passed the 13 operating budget bills. When I arrived, it was standing-room-only in the hearing room, so I had to stand in heels and on a bum ankle for about eight hours. I was walking in my stocking feet the rest of the time. I asked my first question at a press conference! …in May. Uproar ensued after Speaker Pro Tem Bryan Pratt announced on the floor allegations of bribery by Gov. Jay Nixon’s office. Two Republican representatives later identified themselves to the press, saying Nixon’s staff offered career advancements in exchange for votes for the health care bill in question. Don’t be afraid to ask basic questions. I became pretty comfortable with just going to Budget Director Linda Luebbering’s office and asking her if she could clarify a few budget-related issues for me. The same applies to a few other legislators, and I am very grateful that they didn’t mind explaining the basics to a student reporter. It took me about seven weeks to get a certain interview, and another three weeks to get a certain photo. But they both happened, and you’ll get to see the published result on May 27. Now, it’s 5:30 p.m. and I am still in the House press gallery. The session is to close in 30 minutes, at which time the representatives will throw all their papers in the air. Then it’s on to press conferences, furious article-writing and then — I’ll be done. JEFFERSON CITY, Mo. — Today is the last day of the first regular session for Missouri’s 95th General Assembly, and my last day of regular legislative reporting for The Columbia Missourian. Yesterday, the House adjourned abnormally early — just after 4 p.m. — especially since that was the penultimate day of session. As I learned via Twitter updates (courtesy of @ChadLivengood, @Missourinet and a few others), the House is waiting for the Senate to pass House Bill 191, which has been called the “economic development bill” by some and the “jobs bill” by others. Either way you call it, it was filibustered in the Senate last night, as were several other ecodevo/jobs bills that the House has sent to that chamber. As of 10:44 a.m., the Senate is still third-reading that bill. No matter what happens, though, the gavel goes down at 6 p.m., and in the House at least, the legislators will throw their papers in the air. I’m excited and hope this closing day will go out with a bang. Five weeks, countless hours of shooting and editing, who knows how much equipment and four very tired photojournalism students later, our audio slideshow is finally done. As I’ve previously blogged, my group for the final multimedia project in Advanced Techniques in Photojournalism chose to highlight Hulett House Gym, a mixed martial arts gym representing Columbia in the Midwest Fight League. We photographed their practices in their gym, shot and recorded audio at the April 10 Battle at The Blue Note X, recorded interviews with the gym’s founder/trainer and two fighters and finally pieced everything together in about 15 grueling hours. David has posted the Soundslides presentation on his Web site. Unfortunately, WordPress doesn’t allow me to embed Soundslides files (as far as I know, anyway), so please click HERE to view our slideshow. My most recent article published in The Columbia Missourian received a pretty heavy-handed comment wherein the author wished a snub-nose revolver be fired. At me. The comment has since been deleted, but it was in response to my article about the then-latest status of the concealed-carry House bill. The Missouri Senate Judiciary Committee held a public hearing for a bill that would expand the castle doctrine and remove provisions that prohibit concealed carry on college campuses. Five witnesses gave public testimony, all of whom were in favor of the legislation. One of the witnesses was Isaiah Kellogg, a Ph.D student at the Missouri University of Science and Technology in Rolla, Mo. During his public testimony, Kellogg said he has carried a concealed-carry license since 2005, keeps his gun in his car trunk while he is on campus and wants to be able to carry his gun on campus since he intends to teach at universities after finishing his degree. After the hearing adjourned after 10 minutes and with no executive session (i.e., vote), I literally jumped out of my chair to catch Kellogg so I could ask him a few more questions. Isaiah Kellogg, who has spent 10 years at Missouri S&T and intends to teach at a university after earning his degree, said he supports the bill because it would increase campus safety. Kellogg has held a concealed-carry license since March 2005 and usually carries a snub-nosed revolver, which he must keep in the trunk of his car when he is on campus. Kellogg said Missouri S&T’s code of conduct does not allow concealed weapons on campus, and if the legislation passes, the university is not obligated to change its code of conduct. But if the bill passes, Kellogg said students can argue for concealed carry with the university board. Kellogg has held a concealed-carry license since March 2005 and usually carries a snub-nosed revolver, which he must keep in the trunk of his car when he is on campus. I’m sure that Mr.Kellogg appreciates this reporter letting criminals KNOW where to get a free gun whenever he is on campus. Let’s just hope that the first person that has to face this weapon is the “reporter” that so willingly disclosed this information. I understand the author’s point, but I absolutely don’t think it’s reason to want me to face a lethal weapon. And even if the comment wasn’t meant to be taken completely seriously, it’s still out of line to wish death upon someone. My editors agreed, and so — after I alerted them to the comment — the comment was removed. My immediate editor, Phill, called me after he read my e-mail and said he requested the removal of the comment for two main reasons. The comment was directed at a student who is preparing herself for a career in which, unfortunately, many professionals are constantly under fire and in danger of harm or death. The Missourian should not have allowed such a comment advocating the injury or death of one of its reporters to be published on its own Web site. I can’t really argue against either, but I’m also biased. On a tangential but related note: Normally, I despise prior review/censorship of content in journalistic publications, regardless of whether that content is an article or reader-submitted. But also normally, I think readers should submit only content that they don’t mind their grandmothers reading. So, do I agree with Phill’s second point? Again — I’m biased. But I’m not sure that a system wherein a Missourian editor filters all the incoming comments before allowing them to be posted is the best solution, either. JEFFERSON CITY — Isaiah Kellogg, 27, carries a snub-nosed revolver for personal protection, but when he goes onto the campus of the Missouri University of Science and Technology in Rolla, he stores it in a safe bolted to the frame of his car. Kellogg, a doctoral student in mechanical and ceramic engineering, would prefer to carry the gun on campus, too, for his own safety. Last night, he testified before the Senate Judiciary Committee in favor of a legislative provision that would allow the carrying of concealed weapons at higher education institutions. JEFFERSON CITY, Mo. — On Saturday noon, I will be in Washington, D.C., with ten days to spare before my internship at washingtonpost.com begins. This means I have four-ish days to write two articles, do an audio slideshow, complete the final group project for Advanced Techniques in Photojournalism, take my sociology final exam and pack up everything in my room/kitchen. In addition, I’ve scheduled coffee and meetings with about four or five different people throughout the week. But in five days, I’ll be in Washington, D.C., where I’ll begin 92-96 days of summer (depending on my end date). Hence, “90ish days of summer” will be the running title/motif. I haven’t had time yet to determine specific goals for this summer. Right now, I’m waiting for the Missouri Senate to adjourn so I can report on a 6 p.m. Senate committee hearing. But that doesn’t mean I haven’t started thinking and daydreaming about Washington. In the meantime, I’m going to do my best to keep my head above water in this final week in Missouri. Welcome to the last installment of photos from the westward spring break roadtrip that Esten, Jeff and I took! It certainly took a while to edit all the photos, and then a while to upload everything and blog about them. But I hope you’ve enjoyed following along with our weeklong exploration of the American West as much as I enjoyed taking the trip, shooting the photos and blogging about them. If you’ve lost track of where we went and what I’ve already blogged about, here is a list of all the posts I’ve written about the trip. If you’d like to see all the roadtrip photos that are available online (no, I haven’t posted every single photo in my blog entries), you can view them here. And now, without further ado, let’s tackle this last set of spring break roadtrip photos! DAY 6 (Saturday, March 28) — cont’d. Why were we in Alamosa? Because it’s about 35 miles from the Great Sand Dunes National Park and Preserve — our last destination before heading back to Missouri the next day. [Brief side note: I don’t know if we’d really planned out or thought about this, but one of the great things about our trip was the timing. In terms of the season, our timing was impeccable because the weather wasn’t miserably cold or unbearably hot and the Grand Canyon wasn’t teeming with tourists. 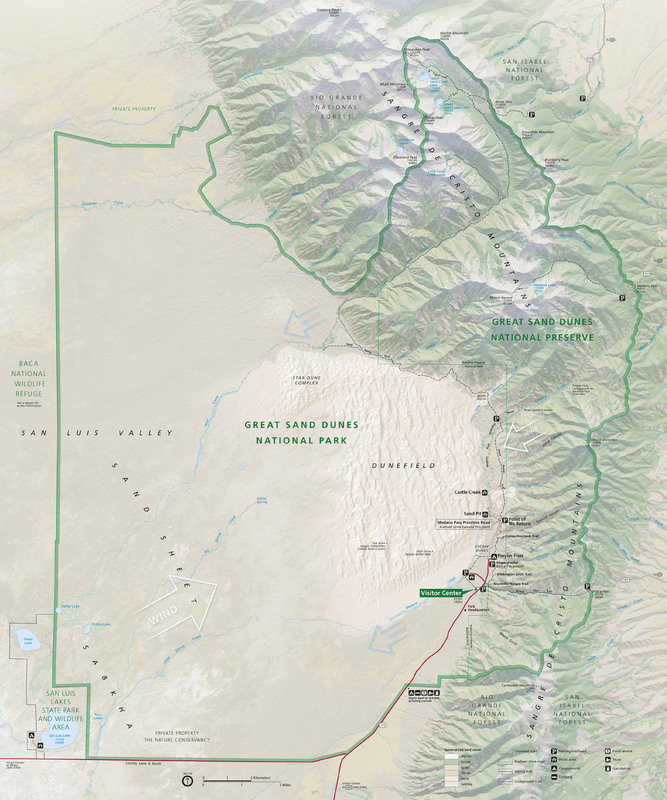 Moreover, Black Canyon of the Gunnison didn’t charge us an admission fee — and neither did the park ranger at the Great Sand Dunes. When we first rolled into the Great Sand Dunes, we stopped at this viewpoint along the highway for some general landscape photos. 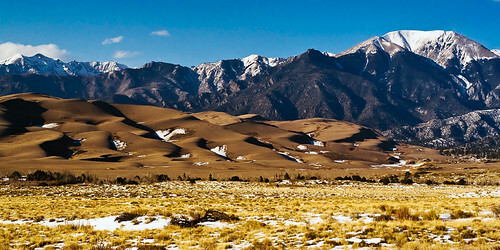 The Great Sand Dunes, at the western base of the Sangre de Cristo mountain range. We drove further into the park, passed the Point of No Return (i.e., into the 4-wheel drive zone) and parked at the Sand Pit. From there, we hiked out and soon encountered the Medano Creek. 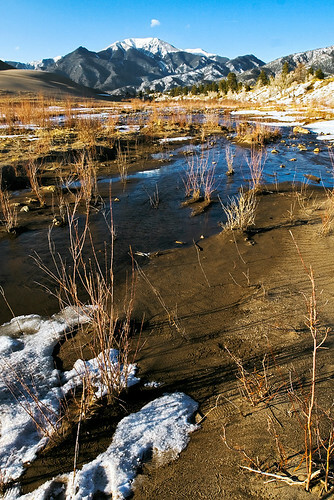 The Medano Creek, which separates the dunes from the eastern side of the park. This was HDR'ed. Apparently, the Medano Creek does not have a permanent streambed and resembles a beach during the warm season when the snowmelt from the Sangre de Cristos raises the water level. I’d love to see that. And I mean that in a good way. Another note about the creek: it’s not just one streambed. It diverges into many smaller streams, which makes crossing it a lot of fun during the dry season. The widest stream was the last we had to cross, and was about four feet wide at the narrowest point we found. Of course, I was wearing Chacos and hiking socks. So of course, I got my feet very wet and cold — and, later, very sandy after trudging through the dunes with wet socks and sandals. Oh well. Esten, nearing the top of the first sand dune we ascended. Jeff tears down the first sand dune we ascended. 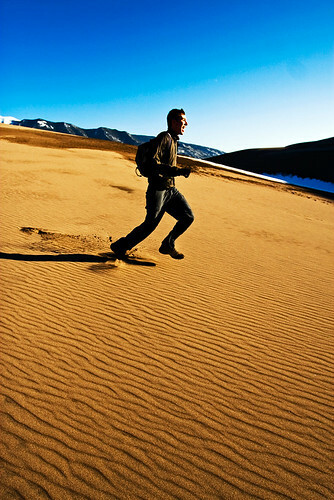 His downhill stride was at least four and a half -- if not five -- feet long. I think it’s safe to say that this was the park where we had the most fun. Sure, it was still freezing and terribly windy. Sure, my feet were about to fall off after crossing the creek in sandals and my hands were numb beyond feeling because of the wind. But I mean, come on. 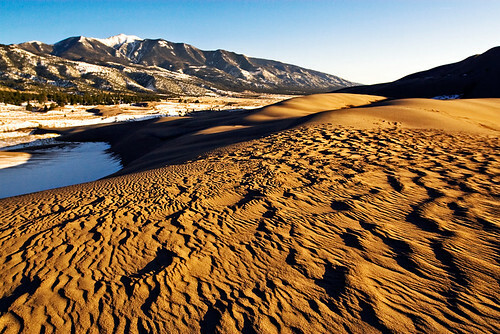 These are sand dunes in excess of 400, 500, 600 feet in height! (The tallest is 700 feet high, but we didn’t make it that far into the dunefield.) It was essentially one massive sandlot, and we had a lot of fun just messing around. Plus, we were the only ones in the general vicinity. Not that this tempted or prompted us to do anything reprimand-worthy. But it was strange, refreshing, wonderful and almost scary to know that for these few hours, all that mattered were these big piles of sand and the three of us enjoying it. The vista from the second or third dune I ascended. The geology and how everything came about really, truly puzzle me. Every park and attraction we visited this trip — the isolated plateaus near Sky City, the Grand Canyon, the San Rafael Swell, Arches National Park and now the Great Sand Dunes — was simply stunning in form and beauty. I’ve tried reading up on the geologic history of all these places and am still baffled and in awe. 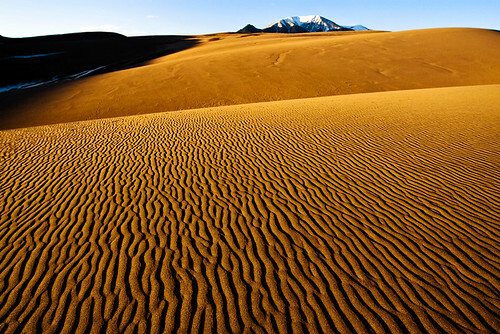 But eventually, you can only take so many photos of sand dunes. They all look the same after a while. So we left. And it wasn’t until about three hours later that my feet felt normal again. The next morning (Day 7: Sunday, March 29), we drove from Alamosa to Columbia, Mo. This meant a very long trip through first Colorado and then Kansas, and we didn’t arrive back in Columbia until about 12:30 a.m. on Monday, March 30. Why are there no out-of-the-car-window photos of that last leg of the trip? First, eastern Colorado can’t quite compare to the rest of that great state and I was asleep for much of it. Second, as an MU Tiger, I have a moral objection to photographing anything in Kansas… unless it’s the Tigers battling either the Kansas Jayhawks or the Kansas State Wildcats on their respective home turfs. Um. I’m really glad we were able to take this trip. 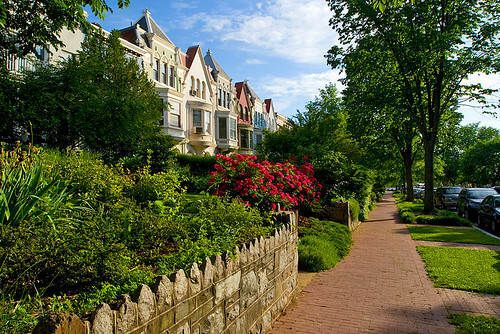 And pull off our ~3,700-mile* itinerary. And take awesome photos. And have an amazing time. When (not “if”) I have the time and money, I am going to go back West. If anything, this trip has inspired me to explore more fully the raw beauty of the American West, which certainly deserves more than a week’s worth of travel. In the meantime, I am sad that I have no more photos to share with you but glad that I could share so much. I hope you’ve enjoyed it — thanks for reading! Keep checking back for more musings and (photo)journalism adventures! * Despite what the embedded map information would say, I’m adding a few hundred miles for some of the off-road trips we made, as well as some longer detours. DAY 6: It’s the Continental Divide, y’all! Shortest spring break roadtrip blogpost EVER. 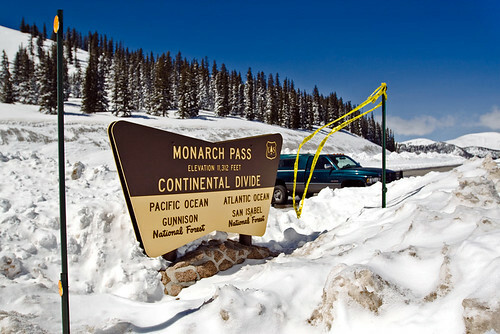 On our way from Montrose, Colo., to Alamosa, we naturally crossed the Continental Divide, via Monarch Pass. It was a fun trip up to the natural backbone of North America, with a 6 percent uphill grade and a fantastic vista. 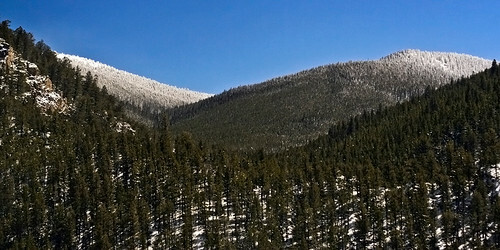 The view while going up toward Monarch Pass. Then we reached the top — the pass itself! — and stopped for a few minutes to take photos. Welcome to the Continental Divide, at 11,312 feet above sea level! There wasn’t too much else to see. So we did our best to shake the snow off our boots and then drove down and away from the Continental Divide. I’ve got to admit, working the White House beat is vastly intriguing to me. Now, as has been reported in the past few days, White House photographer Pete Souza has opened a Flickr account for the White House. Pres. Obama apparently does not know how to hold a DSLR, but I'm not going to hold it against him. And, as you'll read further in this post, I'm not sure how to attribute this photo. Copyright 2009 by Pete Souza? The vast majority of the 310 photos uploaded thus far were placed online on April 28, just before Pres. Obama marked his 100th day in office. It appears that Souza will keep the Flickr stream live, at least perhaps on business days, as his last upload was Friday, May 1. Because I’m curious (read: nosy), I checked Souza’s EXIF data on his Flickr photos. The trip really wound down after we visited Black Canyon of the Gunnison. By that, I don’t mean it became any less exciting or beautiful — but rather, I at least began to realize that the spring break and our adventures in the American West were coming to an end. During our 217-mile drive from Montrose, Colo., to Alamosa, I definitely reviewed all the photos on my memory card and thought a lot about the fun we’d been having. I also took a lot of photos out of the car window as we whizzed past. 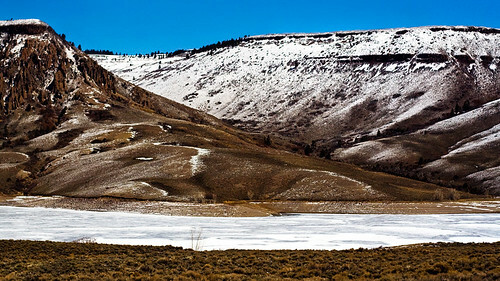 One of our first glimpses of the Blue Mesa Reservoir. 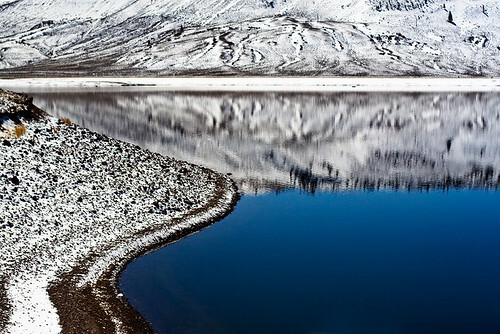 Obviously, this portion was frozen over, as was the case with much of the western portion of the lake. 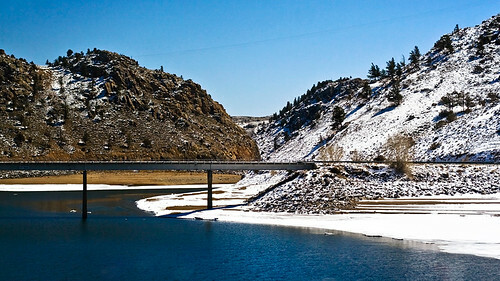 The Blue Mesa Reservoir is Colorado’s largest body of water. It’s located within the Curecanti National Recreation Area, and apparently is home to the nation’s largest Kokanee salmon fishery. It’s pretty massive. We drove past it and over it for quite a long ways.